Most people have heard of the board game Monopoly, a game which like Marmite, children soon learn to love or hate. The playing pieces are a feature of the game, an iron or an old boot are echoes of the poor (the losers? ), the top hat representing the wealthy, with wheelbarrows and sport cars to carry home the cash. Perhaps it is significant that pieces representing the poorest are being phased out, the iron to be replaced by a cat. Today’s game, of wheeling and dealing, auctions and interest rates, is reminiscent of the cut-throat competition of stock markets, and banking fuelled by greed and ruthlessness. And like those, the game continues until all but one is eliminated, everyone else’s funds exhausted – and if mirrored in the real world, destitute, bankrupt, and left without the means to survive. The winner meanwhile has amassed a massive wealth of cash and real estate. What a dreadful lesson to give to our children! But this was not the original intent of the game, inspired by Elizabeth Magie in the late 1800s and known as “the Landlord’s Game”. In stark contrast to the modern game, this was designed as an example to teach others about social and economic justice. She had studied the writings of Henry George and eventually became one of many people who took on the task of trying to teach others what she had learned from studying Progress and Poverty and George’s other works. 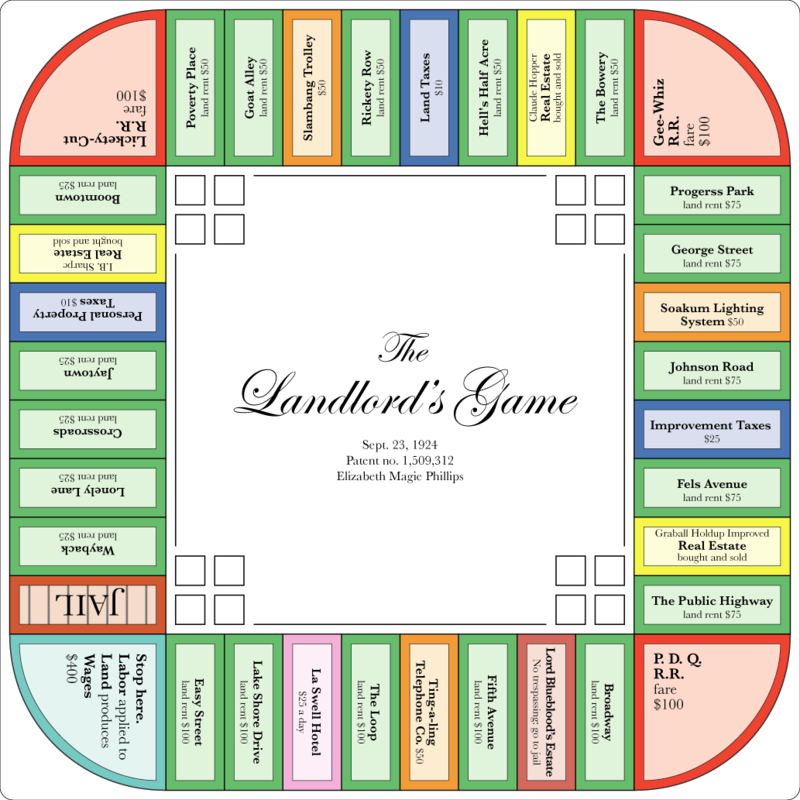 Collaborating with friends in her Brentwood, Maryland community, Elizabeth Magie created The Landlord’s Game. She applied for a patent, which was granted on January 5th, 1904 (No. 748,626). This was a socialist idea, designed for the benefit of all, stolen by opportunists – and changed into the game of Monopoly. How often do we allow this to happen? Lizzie explained that the game was to be a “practical demonstration of the present system of land-grabbing with all its usual outcomes and consequences.” While still a young, single woman, Elizabeth — or “Lizzie” as she came to be called — became a regular visitor to the Single Tax enclave of Arden, Delaware. This was around 1903. Whether on her own or in conjunction with other Single Taxers in Arden, Lizzie continued to work on the design of The Landlord’s Game as a way to explain how Henry George’s system of political economy would work in real life. Now Britain is suffering a massive housing crisis. There simply aren’t enough decent, affordable homes ( Shelter) More than two million people find their rent or mortgage a constant struggle or are falling behind with payments. The UK is now more polarised by housing wealth than at any time since the Victorian era. Today’s Housing Crisis has its roots in Margaret Thatcher’s Right-to-Buy Council House Scheme, offering tenants the chance to own their own homes, but not allowing councils to rebuild the stock. Like Lizzie’s Landlords’ Game, opportunists stole public housing stock, to make a killing, many now in the hands of MP’s lobbyists. In short, like Lizzie’s Landlords’ game, opportunists profit, while others do the work. As Owen Jones, reports in the Guardian today Right-to-Buy has been a definitive disaster. Those council homes, sold off and not replaced found their way into the hands of private landlords – almost forty per cent, and it’s rising. One ex- council flat in Central London has been sold for £1.2 Million (Guardian) Meanwhile, homelessness soars. Almost 40 per cent of former council homes sold on the cheap under the Government’s Right to Buy scheme are now being let out on the hugely expensive private rental market, enriching a new generation of landlords. The first national study of its kind, carried out by Inside Housing magazine, comes as the government prepares to extend full Right to Buy discounts – of more than £100,000 per property in London and £70,000 elsewhere – to a further 1.3 million housing association tenants. Figures released by 91 councils in England under the Freedom of Information act show 37.6 per cent of flats sold to tenants under the controversial policy are being sublet at up to seven times the cost of average social rents. Everyone needs a decent home – people should not be paying astronomical prices and working longer and longer hours for a basic human need, while others can profit, while never doing a “proper job” at all. It is scandalous that people can gain advantage from buy-to-let-mortgages, putting the dream of a home well out of reach. Now hard working people are finding their pay is not enough to pay a rent or a mortgage, and it is predominantly working people who need Housing Benefit to get by – and that Benefit is going straight into the landlords’ pockets. It is siphoning off public assets directly into the private sector. This is a madness, why are wages inadequate for paying for a home? In order to access rented accommodation, massive deposits first have to be secured, plunging tenants into debt before they have even moved in. House prices have risen again recently, giving an illusion of wealth to some, but an unrealistic dream for young people. And then, let us not forget the hated Bedroom Tax, that unkindest cut of all. Monopoly is an appropriate word for the housing crisis and it is becoming increasingly difficult for young people to pay for a decent home. The last Labour government should have addressed the housing crisis. The next Labour government must. It must be a priority for Labour. 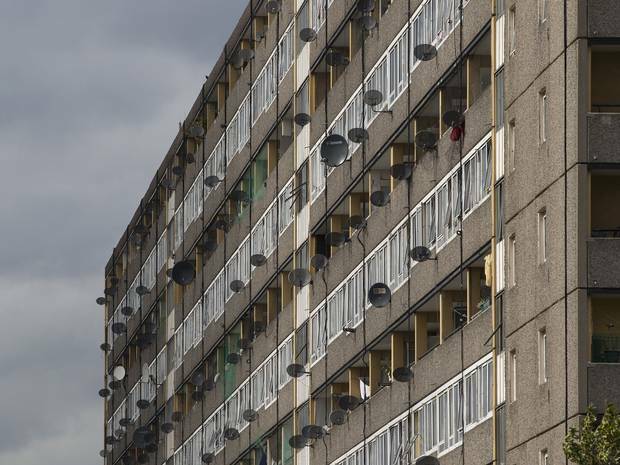 Jeremy Corbyn is promising a “radical reboot” of council house building to tackle the housing crisis. A link to Jeremy Corbyn’s Housing Manifeso is here Please take time to read. Evidence suggests that we need to be building at least 240,000 homes per year(the coalition government averaged 145,000). We should be meeting and building in excess of that target, with at least half comprising of council homes. A National Investment Bank could support new build housing projects with low interest rates, both by councils and developers as long as tough new conditions were met on the proportion of genuinely affordable housing built. For every £1 spent on housing construction an extra £2.09 is generated in the economy. We need to bring (private) rents down to make sure they take up a lower proportion of people’s income, and given that many people are likely to renting for longer and longer, we need to make sure tenants have the right to a longer tenancy. A survey by Survation in January this year showed fewer than 10% of British people are against mandatory legal limits on housing rents. Like Lizzie, there are many intelligent, inspired and creative people with great ideas to share for the good of society. Some of these are in the Labour Party, some in our schools, universeities, factories and offices. Working people. That is where ideas grow, and where wealth grows, We should not allow opportunists to steal what is rightly there for us all. That is what socialism is all about. The Great Housing and Welfare Swindle is discussed at length here Parts 1 ( and 2). This entry was posted in Economics, Education, Employment, Foreign Affairs, Health, Housing, Opinion, Party Organisation, Privatisation, Topical News, Unions and Political Activism, Welfare reform and tagged bedroom tax, Elizabeth Magie, Henry George, housing, Housing Benefit, Landlords Game, Monopoly by Pamplemousse. Bookmark the permalink. Thanks I really enjoyed this. I’m with you but where’s Corbyn on LVT? All I see is building as a the main proposed solution. What about a redistribution of existing housing? Time some of those baby boomers stopped rattling around in their 4 bed detached and swapped with the working families crammed into 2 bedders.